Pay 1000 LP; Special Summon 1 Level 5 or lower Fusion Monster from your Extra Deck, but it cannot attack, also is destroyed during the End Phase. (This Special Summon is treated as a Fusion Summon.) You can only activate 1 "Instant Fusion" per turn. The creatures on Polymerization appears in this card's artwork, both on the cup and in the background. The picture on this card is a reference to instant noodles. The label on the cup indicates the cost of this card, which is 1000 LP. Instant Fusion is the only card that can Fusion Summon a monster from the Extra Deck without involving other cards. Instant Fusion has a Ritual counterpart, Ritual Foregone. They have the same LP cost for activation. Their affected monsters can't attack and are destroyed during the End Phase. Only one of each can be activated per turn. This card, however, is not identical to its Ritual counterpart. This card can only Summon Level 5 or less, while its counterpart can Summon any Level. 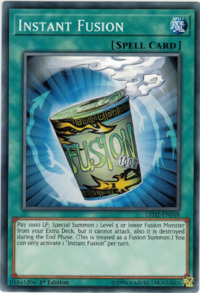 While "Koa'ki Meiru Drago" is on the field, "Future Fusion"/"Instant Fusion"/etc can still be activated, and the effect of "Cyber-Stein" can still be activated. However, when resolving the effect, you can choose neither a LIGHT nor a DARK Fusion Monster to Special Summon. If you only have LIGHT and DARK Fusion Monsters in your Extra Deck, then you cannot activate "Future Fusion"/the effect of "Cyber-Stein"/etc. : Can "Future Fusion" be activated when you cannot Special Summon LIGHT and DARK monster because of the effect of "Koa'ki Meiru Drago"? If non-effect Ritual or Fusion Monster is Special Summoned by the effect of "Ritual Foregone"/"Instant Fusion" when "Non-Spellcasting Area: If "Non-Spellcasting Area" is applied to the field, will a monster Special Summoned by "Ritual Foregone" or "Instant Fusion" be destroyed? 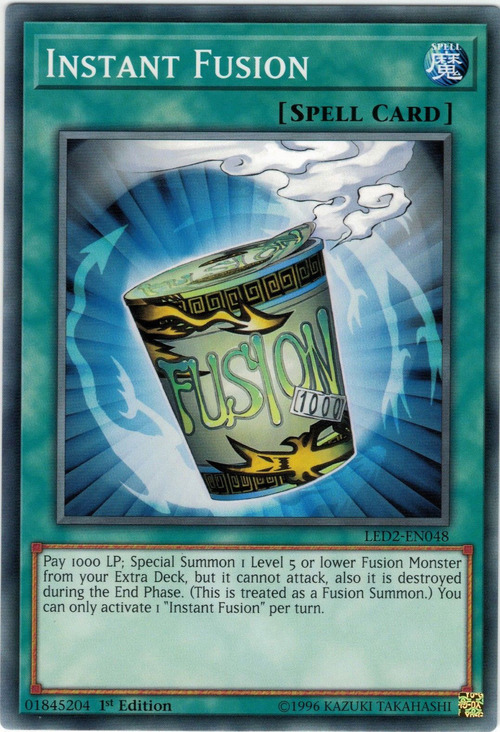 Because the Summon from "Instant Fusion" is a Fusion Summon, Fusion Monsters with the text "A Fusion Summon of this monster can only be conducted with the above Fusion Material Monsters." cannot be Special Summoned with "Instant Fusion". Since the Special Summon from "Instant Fusion" is treated as a Fusion Summon, you can use "Premature Burial" etc. on the Fusion Monster if it is destroyed. Even if "Non-Spellcasting Area" is active, a Fusion Monster that is not an Effect Monster (such as "Flame Swordsman") will still be affected by the restrictions on "Instant Fusion". So it still cannot attack and it is still destroyed at the end of this turn. Even though only 1 copy of this card can be activated each turn, you can chain "Serial Spell" to it to duplicate the effect. If "Destiny Hero - Diamond Dude" uses its effect and reveals "Instant Fusion", you can still activate another "Instant Fusion" that same turn. Chain Material: You cannot use "Chain Material's" effect when resolving "Instant Fusion" or "Future Fusion".